In summary the nocioceptor terminals become more sensitive to the same quantity of the chemical mediators. The cell body which is located in the dorsal root ganglia sensory nerves produces protein channels and transmits signals to the nocioceptive terminals. When there is inflammation present as described above we also get the Nerve Growth Factor produced which transmits up tot he cell body in the dorsal root ganglia. This then also stimulates the production of ions, which as described above, stimulates the receptors on the nocioceptive terminals. Now the nocioceptive terminals have a greater quantity of the 'chemical mediator' stimulating the sensation of pain more frequently. 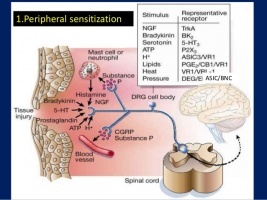 The difference between central and peripheral sensitization can be identified quite easily, as peripheral sensitization become heat senstivie whereas central sesnitization does not Lorimer Moseley explains this in more detail in the video below. Take a look at these two videos. The video on the right explains peripheral and central sensitization, but first 10 minutes of the video concentrates on peripheral sensitization. ↑ Pezet S, McMahon SB. Neurotrophins: Mediators and Modulators of Pain. 2006. The London Pain Consortium, King’s College London.